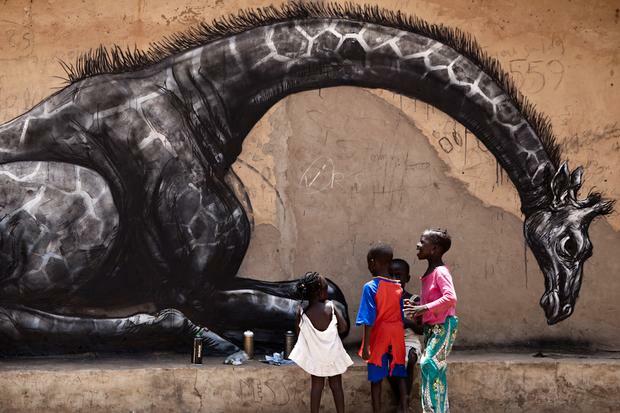 I've always appreciated decent graffiti and street art (although Chicago doesn't have enough of it in my opinion), but some folks in Africa are taking it to a whole new level. 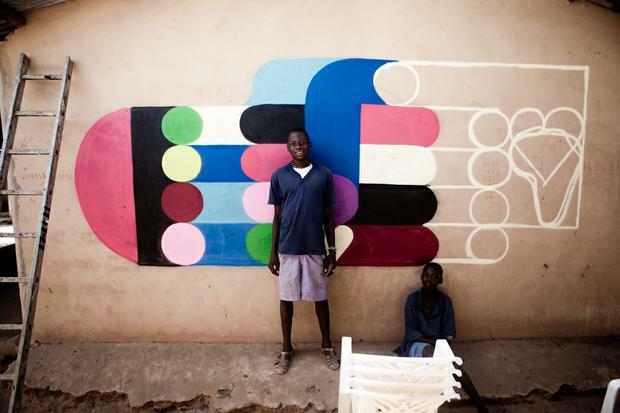 Where: The Gambia - that tiny country along the coast of West Africa that many forget exists. I had a quick layover in The Gambia on my way to Sierra Leone this past winter and its capital, Banjul, looked colorful enough - but clearly I had no idea what was going on in other parts of the country. 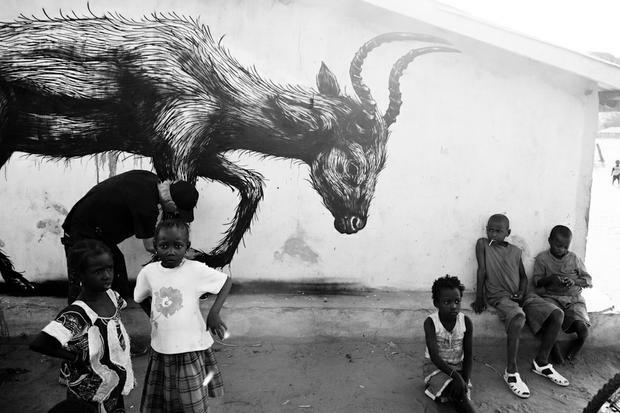 Who: Write on Africa, a South African-based community arts project, partnered with Wide Open Walls, which was created by the owner of a conservation project in Mandina, The Gambia. The result was literally a work of art. What: The collaboration sought to transform villages within the Ballabu Conservation Project into a living art project. But this isn't just to beautify the village. In the long-term, Wide Open Walls "aims to sustain an ethos of responsible tourism" where visitors will come to see the murals, make donations to the village, and then stay to partake in cross cultural exchange and immerse themselves in the friendly culture of the village so as to avoid creating a “drive by human zoo” that you find in other parts of the world. One village chief summed it up perfectly when he said, “they will come to see the art and will find our ethos and way of life and want to learn from us”. People will literally fall in love with Africa the way that I did. 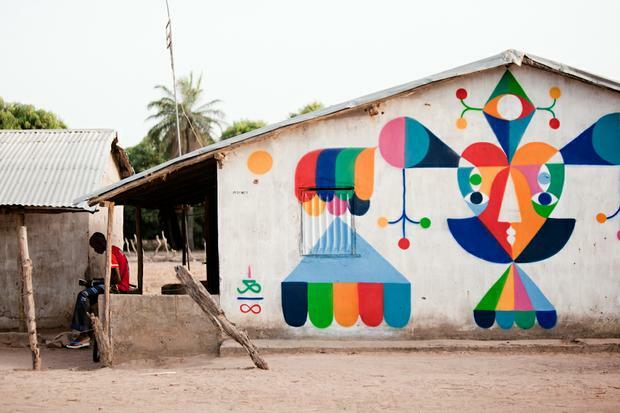 Not only does this project make these villages an open, creative, and colorful art museum, but it leads to their development and will allow tourists to experience the real Africa (the one that doesn't involve safaris). My next voyage: The Gambia. You know one of the coolest projects that I always talk about was to paint houses that are still standing in a disaster zone. Painting houses bright colours seems to have such a beneficial effect on the morale of disaster affected communities and actually increases their engagement in resolving their crisis. I wonder if this is true in development. That is really cool. Mind me asking which country that was in and what organization that was with? I can see how it would boost morale and that is really neat that you got to take part in that! I guess this project will test if it's the same for development.